Charon. He is the ferryman who carries the souls of the dead across the River Styx in the gloomy Greek underworld. Two coins pay his fee, but his work never ceases. In this collection of essays, fiction, poetry, and prayers, this often-neglected divine being is properly recognized and honored by modern polytheists. Mysterious and foreboding, Charon nevertheless waits for us all. Paying our respects while still living will put us in good standing when it comes time to cross the river. It can be purchased in paperback format through Amazon, and through Barnes and Noble. All of the proceeds from Ferryman of Souls – as well as many of the other volumes in the Bibliotheca Alexandrina series – will be used to help promote the revival of the worship of the Greek and Egyptian Gods, with a portion of the proceeds given to a worthy charitable organization in their name. So, not only will you be getting a wonderful book about the modern worship of the Ferryman – but your money will be going to do good work and help the revival of ancient polytheistic religions. 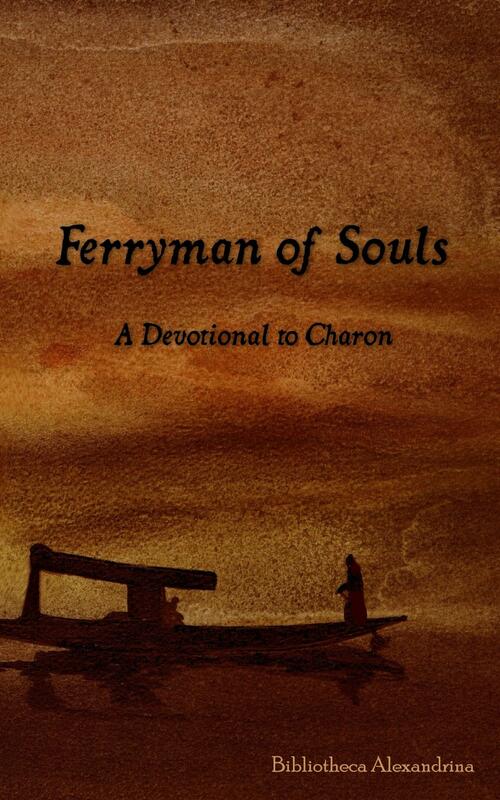 ATTENTION Librarians, Teachers and Retailers: Ferryman of Souls is also available at reduced cost for academic institutions, lending libraries (public and private) and retailers. Check our online store, or email baeditor@gmail.com with any questions. well, am I pleased to find this while surfing Duotrope this morning! Weirdly enough, I don’t have such a fiction, but I see there’s still plenty of time to write one–and write one I will! I simply must, styling myself–as I do–as a Charon with an extra “are”. I look forward to returning!! Would you be interested in a fresh translation from the Italian of Dante’s description of Charon’s interchange with the pilgrim Dante and his guide Virgil? Ooohh, sounds very interesting. 🙂 Email editor Galina Krasskova directly with the submission. Here’s the translation you asked to be emailed to you. If you sent it to tamyris@earthlink.net, than Galina Krasskova received it. 🙂 Thank you.